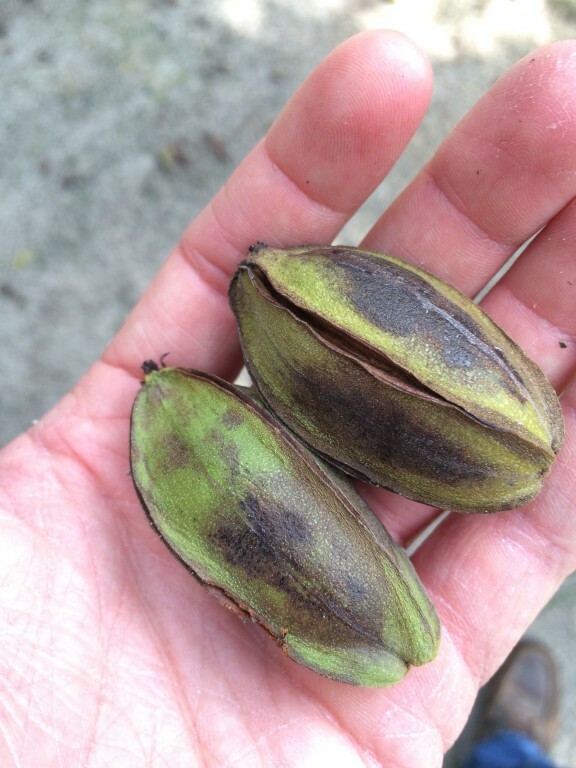 One of the worst things for pecan growers to see is green pecans on the ground dropping from the tree. After taking care of trees, spraying, fertilizing, watering and mowing orchards, for the past six months this year, it’s disappointing to see nut drop. Pecans are susceptible to four distinct periods of physiological nut drop throughout the growing season, in which the tree will abort or shed nuts. The first drop occurs immediately after pollination and often goes un-noticed. The second drop, occurring in June, is the most commonly recognized drop. Certain varieties such as Desirable undergo a very obvious June drop each year. The third drop occurs in July and results from problems with endosperm development. A fourth drop, resulting from problems with embryo development may occur in August. The endosperm provides nourishment for the developing embryo. If the endosperm fails to develop properly, the embryo may be weak and the tree may abort the nut. Also, self-pollination or poor pollination can contribute to the failure of embryo development. 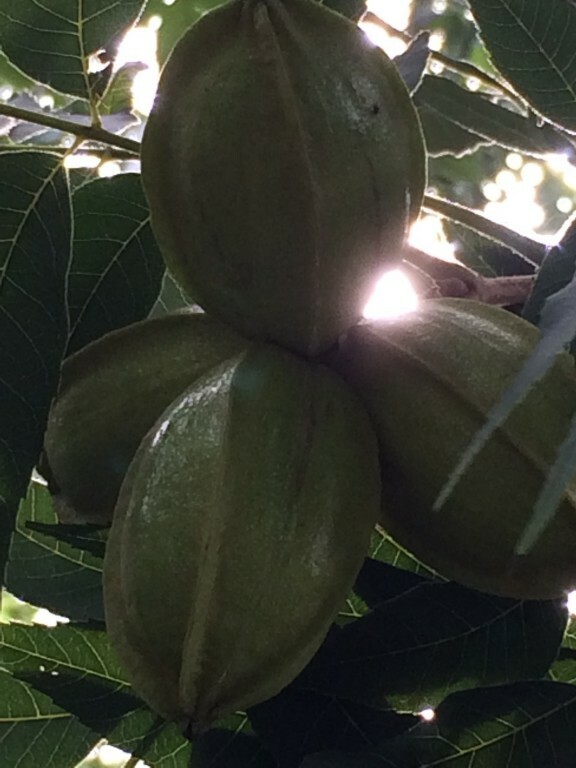 For many varieties, this is the nut drop we are seeing now. 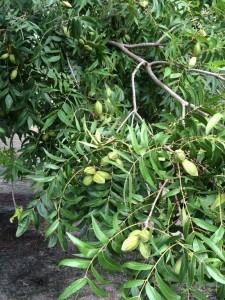 This is something that occurs annually and is a natural aspect of the pecan tree. They will lose a certain percentage of nuts each year. It may be worse on some varieties than others and worse in some years than in others, depending on pollination, etc. For ‘Sumner’, ‘Schley’, ‘Oconee’, ‘Caddo’, ‘Cape Fear’ and other relatively thin-shelled varieties, we are also at the point in the season where water stage fruit-split or “water-split” occurs. The problem occurs when the shell, seed coat, and sometimes the shuck splits about the time of the initiation of kernel filling and shell hardening, resulting in abortion and drop of damaged fruit about 7 days after splitting. Water split is highly erratic, with incidence and severity varying depending on cultivar, crop load, location, environmental conditions, and year. Crop loss can be severe in certain years and nearly absent in others. It occurs during the “late water stage”; a time when turgor pressure inside the nut is high and the shell is beginning to harden. This typically occurs during mid-August for susceptible cultivars growing in the southeastern U.S. This year we are seeing it a little earlier because the crop is at least 10 days ahead in maturity. Like the fourth drop resulting from embryo development, water-split is a natural process which pecans undergo. They will lose a certain percentage of nuts to these maladies each year and there’s not much we can do about it. 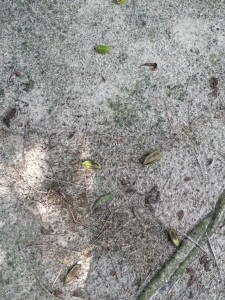 If no obvious signs of insect damage are apparent on the shuck of the fallen nut, my suggestion is for growers to stop looking at the nuts on the ground and instead keep looking at the crop remaining on the tree. Other factors we can control may lead to nut drop this time of year as well. 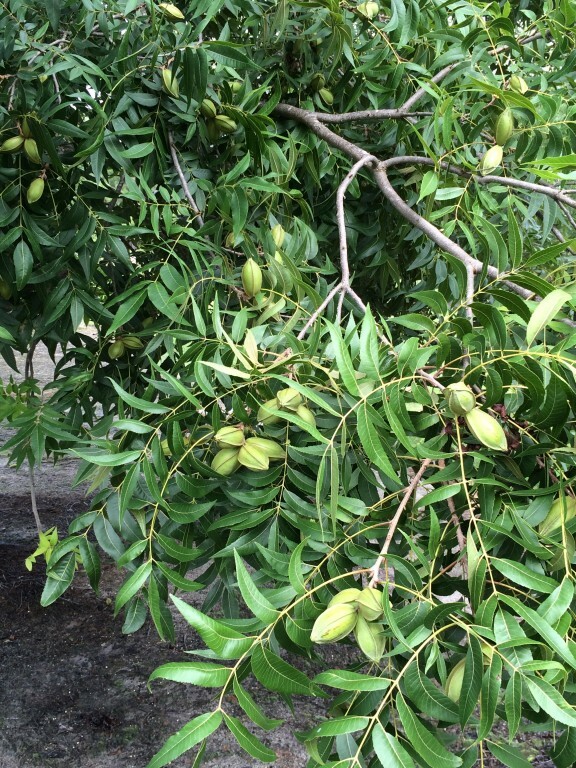 These include nut curculio, pecan weevil, and stink bugs. Weevil and stink bugs are pests that should be dealt with but you want to hold off spraying for them as late as possible unless there is a known problem because the broad-spectrum insecticides required for control will quickly flare aphids and mites this time of year and once you start you will be battling them the rest of the growing season. Previous: Heat Stress and Corn Pollination. What Happened?